J. New presents the Book 3 in the Yellow Cottage Vintage Mysteries series. When the crime scene is pure coincidence and there's no evidence, how do you prove it was murder? 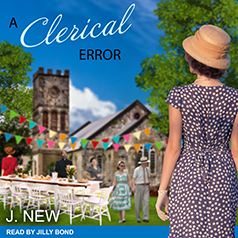 Ella Bridges faces her most challenging investigation so far when the vicar dies suddenly at the May Day Fete. But with evidence scarce and her personal life unraveling in ways she could never have imagined, she misses vital clues in the investigation.